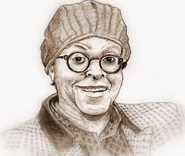 Born in Topeka, Kansas, in 1917, Gwendolyn Brooks moved to Chicago as a youngster—and stayed. At the time of her death in November 2000, she was one of the most celebrated poets in American history: the recipient of more than fifty honorary doctorates and the Lifetime Achievement Award of the National Endowment for Arts, Illinois’ poet laureate, an inductee into the National Women’s Hall of Fame, a professor at Chicago State University. From her stunning debut collection A Street in Bronzeville (1945), through Annie Allen (1950, for which she became the first black to win the Pulitzer Prize), and in nearly twenty other volumes of poetry, she maintained an astonishing ability for finding the perfect subject and language to explore, critique, and celebrate Black life and American life in general. I count it great fortune that I know not only Haki, but was also blessed—the only word for it—to meet Ms. Brooks several times, first as a young professor. “I want to give you something,” she said on that first meeting, and handed me what I thought was an empty notebook, perhaps something to encourage me to write. But, no, it was a copy of one of her latest books, Children on the Way to School, its cover and size made up to look like one of those classic theme books. It did encourage me to write, as she herself encouraged me on our occasional meetings here and there. Later, after we had not seen each other for some years, my oldest son Rick picked her up to come speak again at North Central College where he was now a student. “Rick Guzman,” she said, “Please be sure to say Hello to your father for me.” A double blessing to be remembered. Brooks also wrote children’s books, an autobiography (Report from Part One, 1972), other non-fiction, and the novel Maud Martha (1953) which follows Maud Martha’s life in short, pungent, and highly lyrical passages from her youth through her brother Harry’s return from the war. In between she sorts out what she wants to be “on the inside,” starts a home, observes neighbors, spares a pesky mouse, has children, works as a maid, and goes to a movie house where she and her husband are the only Black people there. Her marriage to Paul Phillips is central. She accepts his kindness, endures his often misguided ambitions to climb in society, and suffers torments about the entwining of love, attraction and race. In Chapter 13, “low yellow,” she says to herself just before he proposes: “I know what he is thinking…That I am really all right. That I will do…But I am certainly not what he would call pretty.” In Chapter 19, “if you’re light and have long hair,” they are invited to the Foxy Cats Ball, probably a prelude to Paul being invited to join the Foxy Cats Club, “the club of clubs,” though Maud Martha notes that its main business seems to be just “being ‘hep’.” Mixing with the glittering but shallow guests, watching Paul dance with the glamorous Maella, she says: “…it’s my color that makes him mad. I try to shut my eyes to that, but it’s no good. What I am inside, what is really me, he likes okay. But he keeps looking at my color, which is like a wall. He has to jump over it in order to meet and touch what I’ve got for him.” To be cherished, to be loved is “the dearest wish of the heart of Maud Martha Brown.” “It oughta be that simple…It oughta be that easy,” she says at the ball. But of course it’s not that simple. It’s just possible—if you yourself endure, and love, and decide you will be joyous on the inside. 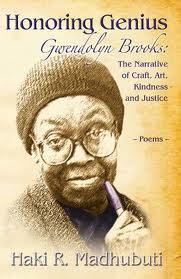 Love, endurance, joy—besides her great writing, Gwendolyn Brooks left these abiding gifts for us. This entry was posted in Black Writers, Chicago Writing, Diversity & Multiculturalism, Poetry and tagged A Street in Bronzeville, Annie Allen. Maud Martha, Black life, Black Writing from Chicago, Gwendolyn Brooks, Haki Madhubuti, love and race, National Endowment for the Arts Lifetime Achievement, Pulitzer Prize, Richard R. Guzman, Teaching Diversity. Bookmark the permalink.